Cayleigh Dorsey was the youngest to stand by the podium at the DRBC hearing. She’s one year old, and was held by her grandmother Alicia Dorsey, from South Philadelphia. The Delaware River Basin Commission heard its first public comments on the proposal to ban fracking in the watershed this week in Wayne County and Philadelphia. 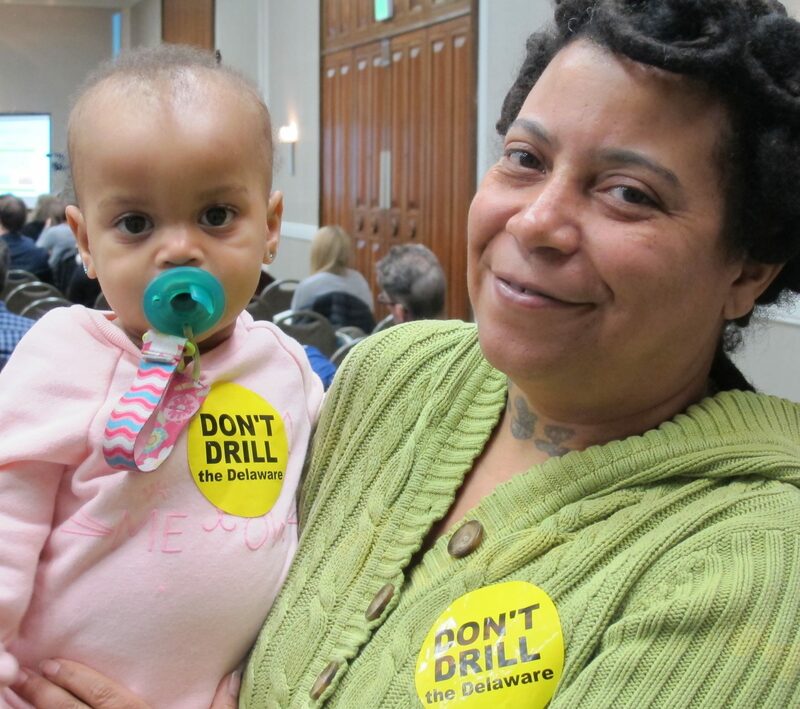 If the DRBC approves the proposal, it would cement a current de-facto moratorium on drilling. But it remains controversial. The hearings this week were calm compared to years past, when commissioners from the DRBC would brace themselves for disruptions and protests and a war of words would break out between Delaware and Pennsylvania state officials. This time around, the commissioners were not present, and in their place, a lone moderator called for civility. Stephanie Herron, with the Delaware chapter of the Sierra Club, was exuberant that the DRBC wanted to ban Marcellus Shale production along the Delaware river. About 16 million people in New York, New Jersey, Pennsylvania and Delaware get their drinking water from the Delaware River. Governors of all four states have expressed support for a ban. In November, the interstate regulator released its proposal, saying it had determined that high-volume hydraulic fracturing “poses significant, immediate and long-term risks” to the waters of the basin, including so-called Special Protection waters that have a high ecological, recreational or scenic value. The Delaware River Basin Commission, an interstate agency responsible for managing water resources in the Delaware River watershed, held a hearing on the proposed ban on fracking in the Delaware River basin on Thursday, in Philadelphia.Unlike previous public meetings, the commissioners did not attend, and in their place is an outside moderator. The proposal emerged after a bitter battle over whether to allow the natural gas industry to exploit the basin’s shale gas reserves in the two Pennsylvania counties — Pike and Wayne — that border the Delaware River. Drilling is prevalent in the rest of Pennsylvania but has been banned in New York. Delaware and New Jersey do not have shale gas reserves. The DRBC regulations trump those set by the four states. The federal government also has a seat on the commission. Tracy Carluccio is with the Delaware Riverkeeper Network, which has been fighting for a fracking ban in the watershed for almost 10 years. Carluccio is happy with the proposed ban. But she’s worried that gas drillers would still be able to ship fracking wastewater into the watershed from other parts of the state. Although the DRBC has proposed regulations for fracking waste water disposal, it is not seeking to ban it. Carluccio wants an outright prohibition on wastewater disposal, along with the fracking ban. DRBC officials counter that the proposed regulations on wastewater are better than the status quo. Not everyone supports proposed fracking ban. Some Wayne and Pike county residents told the DRBC they support drilling at a hearing in Waymart on Tuesday. Betty Sutliff is a retired school teacher and would like to lease 80 acres of her family farm to drillers. Sutliff says she loves her land and wants to protect it, but she feels the risks of fracking have been exaggerated. And she says the additional income from gas leases and royalty payments will help struggling dairy farmers. Dan Rutledge, a Damascus Township supervisor, also urged the DRBC not to ban fracking. Rutledge said those living in Susquehanna County, which is in the Susquehanna River Basin where drilling is permitted, are experiencing economic prosperity while those in Wayne County suffer. The Susquehanna River Basin Commission has always maintained that it only regulates water quantity, not quality. Jonathan Lutz, an industry representative with the Associated Petroleum Industries of Pennsylvania, testified that gas drilling is happening in the rest of the state without hurting the environment. “We are consistently and continually advancing the technology and increasing our safety measures as an industry to ensure that this is developed responsibly and ensure that we are doing the best that we can,” Lutz told StateImpact at the hearing in Philadelphia. The Delaware River Basin Commission expects tens of thousands of comments, which they will review over the next year before voting on the proposed ban. Catalina Jaramillo contributed to this report.